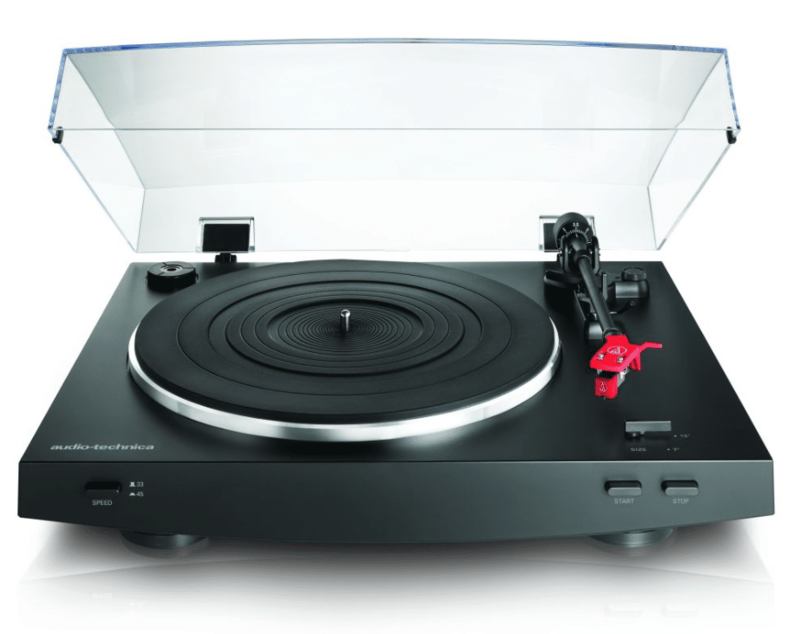 There is a steady stream of very (very) low cost turntables hitting the market. Many of them are sold via colour supplements and the window displays of High Street music shops such as (and God forgive them for their sins) HMV. They include a host of brand names such as Crosley, Ion, GPO plus other, equally dodgy, monickers that ‘do a Bose’. That is, they invest a far higher percentage of the product budget on marketing and aesthetics than actual sonic qualities of their products. All of these products threaten to damage your vinyl, principally because of poor build quality. Unlike many journalists out there, I’ve actually reviewed one or two of them, so I know the horror first hand. 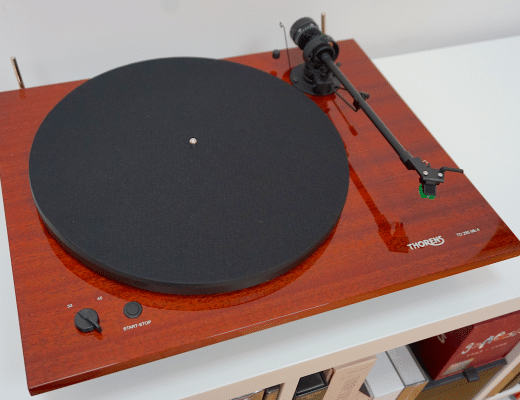 There is another band of turntables out there that hold a higher asking price but that still retain a value for money position, pricing their decks at below the standard budget limit (and by that I would suggest that figure being below £200). These ‘sub-budget’ turntables are variable in quality. I’ve reviewed two of them so far: the Dual MTR-75, which was a bit of a mixed bag in terms of build and sonic qualities as well as the Lenco L-3808, which I found to be superb in terms of sound quality from its direct drive. All of these products are built in China, it’s currently the only way to keep costs down below the £200 mark. This new turntable from Audio-Technica is of the same breed, also built in China and just qualifies for sub-budget status by a single pound. 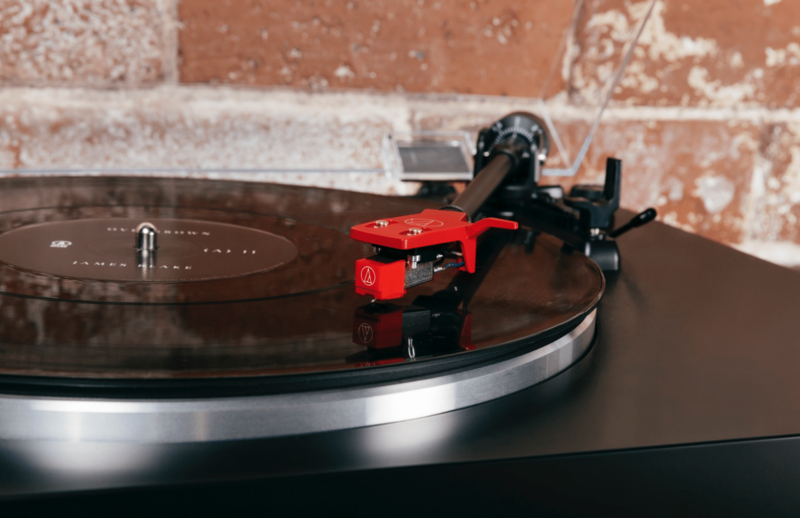 The belt-driven, two-speed, LP3 is a full automatic turntable, meaning that you can operate the deck without having to touch the arm during play. 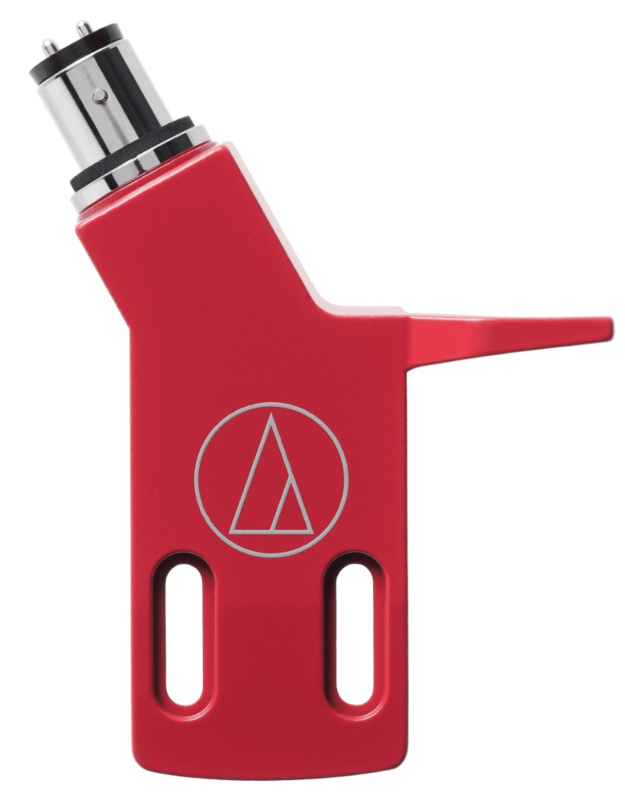 The turntable arrives with an AT91R cartridge (set at a 2g downforce) plus lightweight aluminium alloy tube cantilever (a replacement stylus will cost £18), within an attractively red, SME-type, AT-HS3 removable head shell featuring a built-in finger lift. The cartridge is fitted with a conical stylus which means that detail extraction will be compromised a touch from the off. Anyone buying this turntable will be recommended to buy a replacement with an elliptical stylus for an enhanced performance. The cartridge is fitted to a straight tonearm that features a rest for the tonearm but no safety catch in case of accidental knocks. A poor design decision because beginners can be a little clumsy. The turntable features a built-in phono amplifier. Any phono amplifier is essential to amplify the tiny signals produced by the cartridge. A basic hi-fi amplifier can’t handle the job and so the specialist phono amplifier is asked to complete the task. Once the phono amplifier produces a louder signal, it then passes that to the main amplifier. A built-in model can be useful for three reasons. Firstly, not all integrated amplifiers include a phono amplifier. In this scenario, you would have to buy one so Audio Technica save you the job in this case. Next, not everyone wants to use a standard hi-fi set-up. 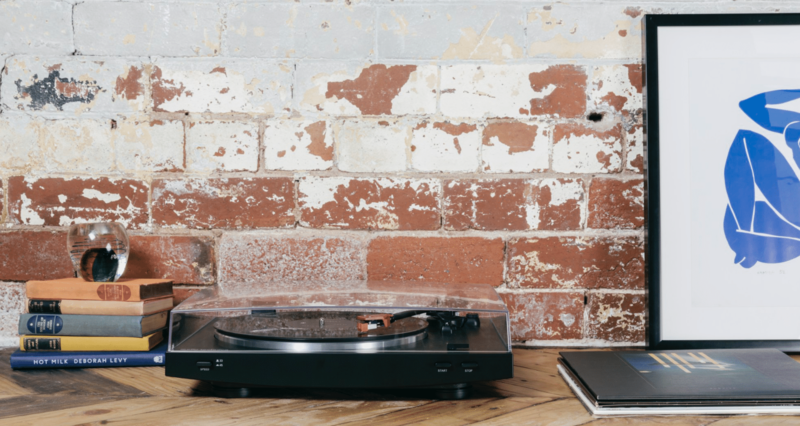 With this turntable, you can easily plug the turntable into powered speakers (that includes the amplifier actually within the speaker cabinets). This configuration is ideal for those lacking in space. Lastly, of course, the giveaway phono amplifier is great for those on a very tight budget. Of course, the Audio Technica phono amplifier is part of the build budget for this turntable and, hence, will be limited in terms of sonic quality. As soon as you can buy yourself a separate, external unit, do so. Internally fitted phono amplifiers also produce electrical noise which hampers sound quality. External models don’t infect a turntable in the same way. 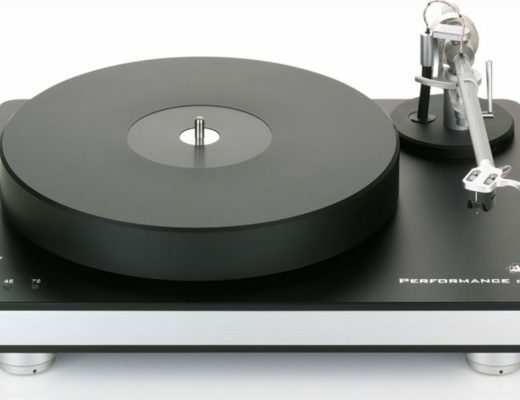 As well as a hinged lid, this turntable also includes a separate switch to allow the operation of a moving magnet cartridge or moving coil cartridge within the turntable. Moving Magnet cartridges are normally cheaper and (there are exceptions) simpler in terms of technology and build. The supplied AT91R is Moving Magnet, for example. 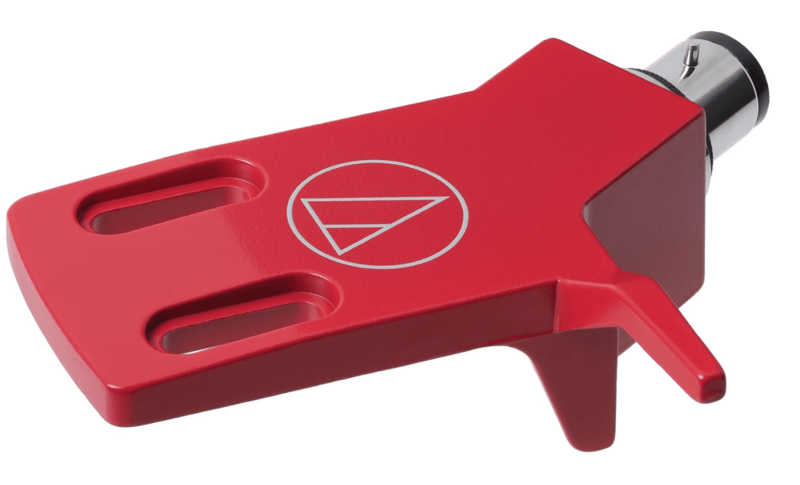 Moving Coil cartridges are normally found in relatively high end turntables and are far more expensive to buy (you can buy low cost variants but models actually worth purchasing cost around £250 and upwards). These sensitive cartridges demand high tolerances from their host turntables to be able to perform at their designed level so why on earth this option has been provided within this particular sub-budget turntable is anyone’s guess and confuses the hell out of me. Any user of this turntable should only use a Moving Magnet. Avoid using any and all Moving Coils in the LP3. Such a cartridge will work, if you’re stubborn enough to want to try, but you will not hear the benefits and, even if you do hear some improvements, then the majority of those benefits will be lost to the LP3. Hence, purchasing an MC cartridge for the LP3 doesn’t make economic sense. Other features include a damped arm lift, die cast aluminium platter, 4.5mm rubber platter mat and an all in weight of 5.2kg. The front of the plinth provides the On and Off buttons plus Power button. On top of the plinth is the 7” and 12” disc selector for the automatic operation. Around the back is the MM/MC switch, phono or line switch plus RCA sockets and a figure of eight power chord plugging to the built-in power supply. The power block is fitted to the plinth underside. Not a great place, I have to admit, as vibrations from it will infect the delicate cartridge, hampering sound quality. OK, ok, I’ve delayed the unmasking until now but those of you with eagle eyes will have formed a double take when looking at the LP3 because it is almost exactly like the Dual MTR-75. In fact, the only differences are the cartridge, restyled control buttons on the front, no USB port (as seen on the Dual) and the inclusion of that dreaded MC/MM switch instead along with a slightly different platter mat. The overall build quality feels similarly plastic-like but the Audio Technica has a rather more solid feel to it. It’s actually a lot heavier than the Dual by over 1kg. Audio Technica does report that its turntable features extra damping and so I assume that it is the reason for the extra weight. I began by playing the Connie Francis original pressing Sings Bacharach and David (MGM) from 1968. The lady herself sings in front of a full orchestra. I began the test with the LP3 pushing music through its internal phono amplifier. This configuration is ok and perfectly usable and, as such, will get any analogue fan underway in terms of playing vinyl. In critical terms, though, sound was a little indistinct and muffled at the bottom end with a rolled off suite of upper frequencies that hampered detail. As a money saving option, the built-in unit is acceptable and will produce an admirable sound for the price but an upgrade to an external unit is top priority. Moving on in such a configuration, using an external phono amp and beginning with the lead vocal, despite a bright tone that hung around the various crescendos, Francis did provide lots of energy and vigour and a sense of passion in terms of her delivery. The treble-infused cymbal taps that sat right next to her in the centre of the stereo image were similar unfocused, providing smearing to the upper frequencies. That said, the cymbals were big and bold and were never masked by other frequencies, Audio Technica’s damping application may have helped here. Although the brass section wasn’t the smoothest I’ve ever heard and strings never really flowed as they should, the orchestra did offer a grand and rather epic staging that provided Francis with a large canvas to paint her words. The piano was similarly lacking in precision but did offer a sense of musicality. It was always interesting and leant an added atmosphere to the music. Bass, meanwhile was rather blurry and boomy but it could have been a lot worse. The above-mentioned damping did help in terms of stability which provided a measure of lower frequency control, driving the song steadily along. Via this high energy, drum-centric song, the blooming bass and smearing midrange held slightly less sway and importance. The evident musicality of the LP3 rose to a prominence here, allowing the ear to just enjoy the performance and the passion behind the presentation. Yes, the bass guitar was a little masked within the mix and some of the shy synth lines were not picked out particularly but the overall nature of the music was one of emotion and spirit. This was particularly noted from the lead vocal. OK, his voice lacked a sense of subtly and texture but he did throw himself into the song with a robust sense of vitality. 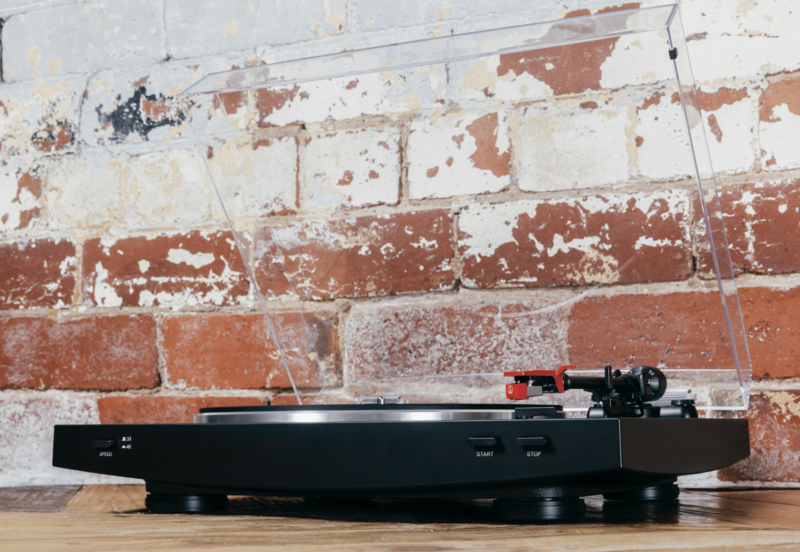 Although there are sonic issues, this low cost turntable provides a wealth of features and, in sub-budget terms, is put together fairly well. 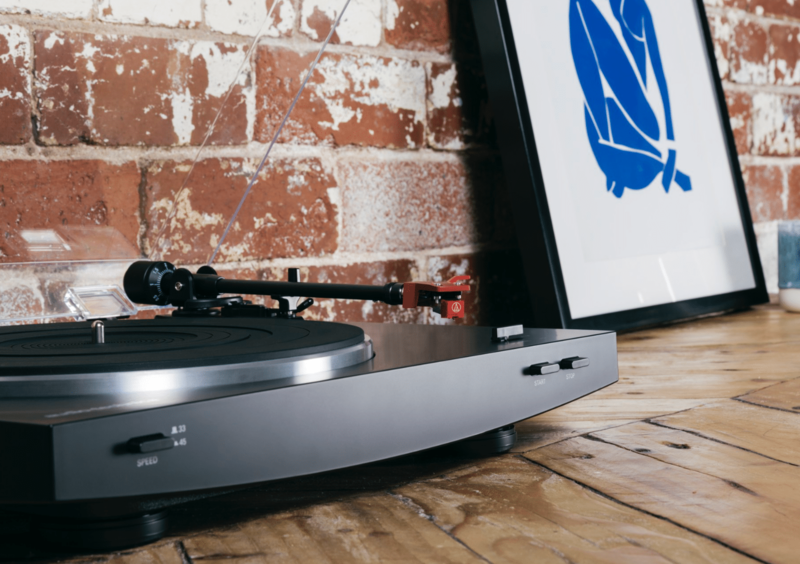 The Moving Coil option is a puzzle and there’s no USB option but the automatic play system works perfectly every time and the internal phono amplifier could be a life saver to those users on a budget. More importantly, it’s a valid and recommended choice when you compare it to the Crosleys and Ions of this world. For any beginner to the world of vinyl, the Audio Technica AT-LP3 is a steady front end for any sub-budget hi-fi system. This will bring more young fans into the two channel vinyl love party,and more seasoned listeners back to a comfy dabble price. You tried it with an external preamp? Sorry Gard if I didn’t make the text clear enough – my fault – in the Sound Quality action, after the second paragraph, that’s when I used the external amp. I’ll tweak that now. How is speed accuracy in this turntable? And I’d be using it primarily for spinning 45s. Hi Richard – yep – it’s pretty good. I tested it with software I have here and, considering it’s a low cost unit, the speed is good. Can you recommend a stylus upgrade that’s better than the one supplied with the LP3 but not too expensive, relative to the cost of the turntable? By all means shop around to see if you can find a lower price. Good morning! Have you also tried this one with better (elliptical) styles (Like the proposed AT95E)? Hi Peter – not on this turntable, no. I have tested the cart on other turntables though and it is recommended and will improve the performance over and above the spherical-tipped default cartridge supplied with the LP3. 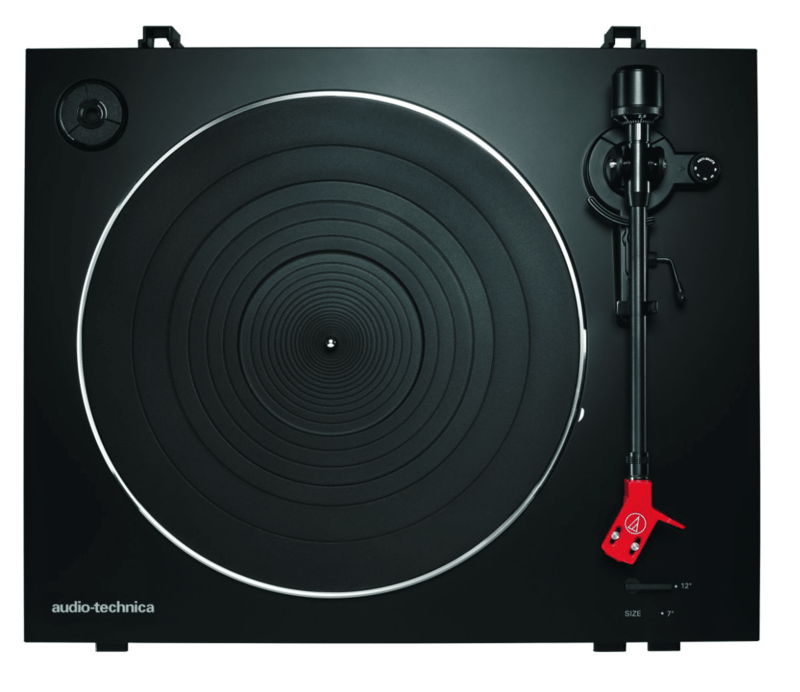 Can I make this clear to all expert and user reviewers of fully automatic turntables, the reason there is no latch on the tonearm is simply because one accidental press on the start button while the latch is in place will leave the owner of such turntables with a broken mechanism, come on guys think before posting this as a con. Hi James – I would suppose that there’s a host of possible issues and potential problems whenever a user approaches a turntable…no matter what it’s flavour and drive mechanism. I do wonder at the robustness of any automatic mechanism, though, if it is doomed to fail because a tonearm latch is left on. I’d like to get an external phono amplifier, but am unsure of which product to buy. I wouldn’t want to spend excessively on a low budget turntable. I just cam justify spending more money on an amplifier than the price of the turntable itself. Hi Timothy – if you’re looking at a phono amp for the AT-LP3 then spend no more than £60 on a Pro-Ject Phono Box. How would you compare the LP3 with the LP60? Does it justify the jump in the price in regards to sound quality? Am I going to hear a difference between the two? I can afford both but want to know if its worth it. 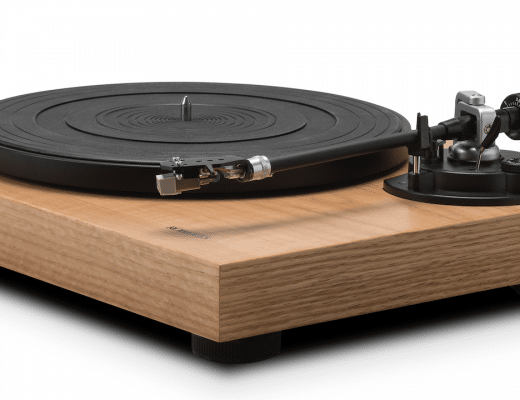 Hi Nick – if sound quality is that important, I would go for a Rega Planar 1. If money is tight and you want a built in phono amp plus USB, I’d plump for the Lenco reviewed here: https://theaudiophileman.com/lenco/. There are marking on the bottom of the unit, one for 45 and one for 33. Can I adjust the speed through those slots? Mine plays a little fast. Yes you can, Josh – be careful though and only adjust by tiny amounts at a time – check after each tiny tweak. I have a Technics SL D2 with an AT-95e cartridge that is sporadically only playing through one channel and is extremely low. Through trouble shooting it seems it’s a faulty wire with the turntable itself. Instead of taking it apart or finding a repair shop I was going to replace it. Would you recommend the LP-3 as a suitable replacement (with my same cartridge) or will I likely be disappointed in the audio quality? A Rega is out of the budget. Thanks! i´m a begginer user, and i just bought the LP3. i connected it to a denon receiver. since it has a built in amp, i connected it directly to the receiver, and its working ok. reading the comments, i dont know if i misunderstood, but you suggested to buy the pro ject phono amp, to upgrade the existing built in phono amp. i was wondering how would that work for me. Hi Humberto – thanks for the question. Your receiver includes a phono amp, built into the chassis. You will have connected to it via the Phono sockets. As you say, this works fine. If you use an external model, just the physical act of separating the phono amp’s electronics from your amp, decreased invasive and masking noise and increases sound quality. In use, you plug your turntable to the external phono amp and plug the external phono amp into the amplifier, as you might a CD player. Hope this helps. thank you for your quick reply. it helped a lot. i´m going with the pro ject phono which you suggested previously. I’ve got the remnants of an old home cinema system – a Sony strdg820 amp and a couple of Mission m73’s. I was bought one of those Akai £40 sets for crimbo which just doesn’t cut the mustard. Volume is poor so I bought an Edwards MM phono amp not realising it wouldn’t work so now I’m looking at the LP3, the LP120USB, the Roberts RT100 or the Sony PSHX500. Unfortunately this will be a catalogue purchase on interest free credit so although there are probably badly better options I’m restricted to these – any thoughts on which way to turn ? If not the Lenco then the Sony and Audio-Technica decks would be next down. The Roberts would be at the bottom of your list. I just placed an order for the AT LP3. I have a Onkyo 575e AV receiver which has a phono built in. What would be your recommendation- 1) use phono of AT LP3 and plug it into an aux input of my AV receiver. 2) Use the phono of my AV receiver and bypass the AT LP3 phono. Hi Anshul – ideally? Neither 🙂 That said, the best of the worst is the phono amp in the the AV. I would use that. 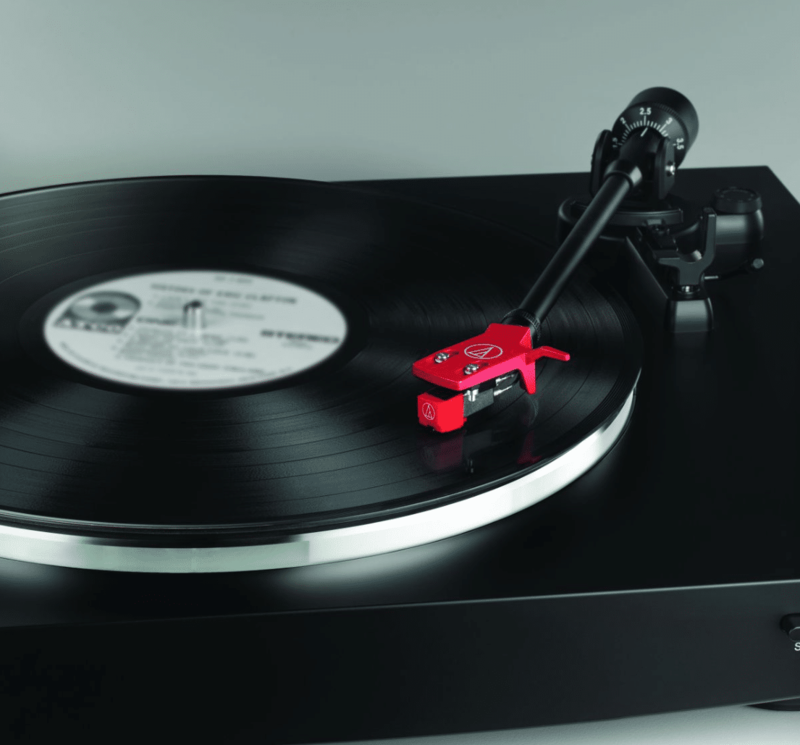 The most sensitive product in your hifi chain is the turntable. Electronic noise from its inbuilt phono amp will create more sound veiling damage there. Next upgrade? An external phono amp. When you get to that point, give me a shout and I’ll help you then. I would recommend the Pro-Ject, absolutely. An external phono amp is far better in sonic terms than any internal model. As for the power? Let me check with Pro-Ject for you. Be back ASAP. Ok got it. Thanks. And you think it will improve the sound significantly? Hi Paul, I am unable to get the project phono box mm at Singapore. I can see an option of project phono box E. The specification look the same at phono box mm. Would you recommend that I buy that instead? Hi Anshul – yes, that shouldn’t be a problem. Hi Anshul – you need to talk to your retail supplier, the place from which your purchased the Phono Box. It could be a faulty unit. If there is a fault with the unit then I’m sure they will replace it if you email or call them. Try this route before looking to contact Pro-Ject, at this stage, because you have consumer rights. Also, please try the obvious checks before you call such as a loose connection/plug, fuse issue, etc. Plug the unit into a different wall socket or, if its currently plugged into a power block, an alternative block. Make sure the issue is with the phono unit and not something else, etc. In your opinion do you think I should go with this at 429 Aud or a project essential 2 at 359 aud. Just a note that pricing for the lp3 is when not on sale usually when they put it on sale it is 329 aud. Hi Jesse – if the extra Audio-Technica features are important (i.e. automatic play, built-in phono amp, etc) then go for that. If sound quality is the priority, then got the the Pro-Ject. Hi Jesse. I think so, which one to choose: AT95E or AT95EX 🙂 Which will sound better? Hi Krzysztof – thanks for your note. I haven’t reviewed them together but, in theory, the EX because of its superior quoted frequency response. Hi Jacek, thanks for the question – neither is the preferred option, if the choice is available. An external model is preferred. In terms of the ‘best of the worst’? Yep, I’d go for the Yamaha’s phono option because it puts distance between it and that stylus. Hi Anshul – the Rega. Many thanks for your question – you’ll need to change the entire cartridge, Sal. Can I bother you with a beginner’s question, please? I take delivery of an LP3 on Monday (I hope), and am I better using the inbuilt phono stage on my Arcam SA20, or should I use a spare NAD PP1 phono stage that I have? Hi Simon – separate is always better than bundled. That’s the mantra. So yes, please use the NAD. The built-in phono will infect the sound with a veiling electronic noise, otherwise. Good advice Paul, many thanks for that. For anyone reading Paul’s words, don’t forget to use a cartridge alignment gauge to set your own cartridge position.If anyone needs help sourcing one, give me a shout.